During the month of November I always see a lot of daily posts on Facebook from people listing what they are thankful for. The things listed range from basic necessities to more complex issues. Of course this made me think about what I am personally thankful for and I realized that I am very blessed. It also got me thinking about the use of the words “thank you” or “thanks”. How many times each day do we use these words? And, more importantly I think, how often do we actually attach any meaning to them? As children we were taught to say “please and thank you” which is great. However, I fear that with the development of this habit we tend to lose some of the true meaning of the words and say them without thinking of the impact they may have. We all want to be appreciated for what we do, no matter how big or small the gesture. Honestly, it makes us feel good. I’ve wondered how often a simple “thank you” may be the only affirmation that some people receive for the entire day! The more I’ve thought about this the more it has occurred to me that I need to truly cultivate an attitude of gratitude within me and demonstrate that thankfulness to others. I need to have an attitude of gratitude each and every day in everything I do, not just in the month of November. 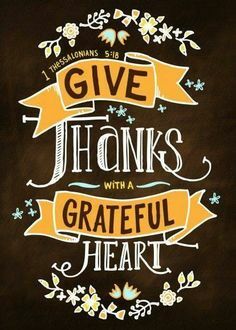 I’ve realized that I haven’t been doing a good job of being thankful in everything (both the good and not so good); nor have I given God all the praise for all his favor and blessings. I’ve received a number of confirmations from devotionals, scriptures, and other readings so I know that I am on the right track. Additionally, a couple of weeks ago in church we received a “gratitude rock” in church to carry to remind us to be thankful. Now, while I can’t boast that I always remember to be thankful my goal is to look for something to be thankful for in every situation. I’ve found there is always something to be thankful for, even if considered trivial by some. I’m asking God to help me stay focused on Him and how he provides for me each and every day. How nothing that happens is outside of his plan; and even when things don’t go the way I think they should there is something I can be thankful for in the situation. Yes, even when the not so good happens we can find something to be thankful for. I also want to be more intentional in my everyday interactions with people. Especially those with who my “thank you” may be the only time I ever speak to them. I want these people to truly hear a thank you from a heart that appreciates what they did. I want my thank you to not be rushed or hurried as I head out the door to my next appointment. I intend to make eye contact as I say thank you. I want that individual to know they are appreciated. Being thankful this year took on a whole new meaning for me. I intend to continue giving thanks every day and in every situation. I’m not perfect at it. I will still get frustrated when things don’t go exactly “right” according to my way of thinking. God lovingly reminds me that His ways are much better for me than my worldly ways and He brings blessings that are too many to count when I obey. So, just a reminder to “Give Thanks”. This entry was posted in Reflections by Cathy McCoy. Bookmark the permalink.